The Best Acoustic and Electric Guitars for Small Hands in 2019: reviewed and rated! Welcome to our special page for the best acoustic and electric guitars for small hands! This is where you’ll find our top recommendations for compact guitar models that are perfect for kids, teens and grownups with a limited reach in their hands and fingers. We’ve chosen these guitars carefully based on their size, craftsmanship, ease of play and overall sound quality. While small hands can get used to holding bigger instruments, comfort is key when playing guitar, especially for kids and adult beginners. It’s definitely more enjoyable to learn guitar chords and build strength on a guitar you feel comfortable playing. We’ll kick off with the best acoustic guitars for smalls hands followed by the best electric guitars for smalls hands, enjoy! 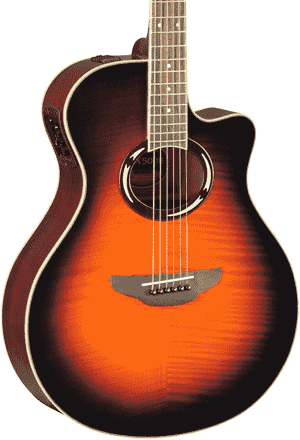 Yamaha APX500III Acoustic Electric Guitar The Yamaha APX500III is an acoustic-electric guitar with a cutaway. In addition to making the top frets easier to reach and letting you plug-and-play as you please, this guitar also offers a more comfortable way to play with its thinline body. Players with a small stature will find it easy to hold the guitar for long periods of time. Baby Taylor BT2 Acoustic Guitar Based on the name alone you would know that a Baby Taylor would be a perfect acoustic guitar for small hands. The Baby Taylor BT2 is the mahogany-top version of the much-loved Baby Taylor. This 3/4 size dreadnought may be small, but it’s got a lot of that dark, woody tone that musicians desire in an acoustic. 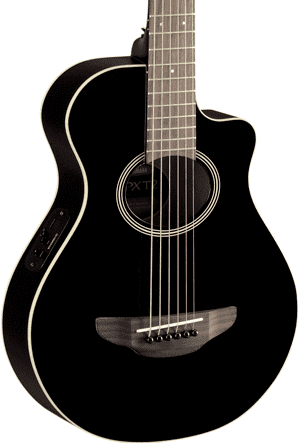 Yamaha APXT2 Acoustic Electric Guitar If you loved the features of the Yamaha APX500III but think it’s still too big for you (or your child), then you’ll adore its mini version, the Yamaha APXT2. 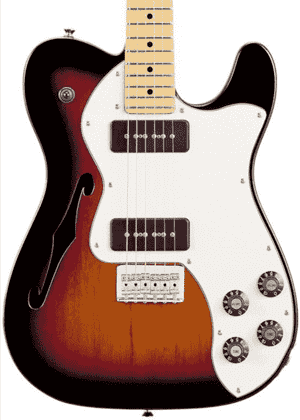 This model has the same thinline body with a cutaway, only it’s 3/4 the size of its bigger brother. It’s also a great guitar to have around when you’re traveling! Martin LXME Acoustic Guitar The Martin LXME is another little acoustic guitar that players with small hands would love. The LXME is fitted with electronics so you can amp up the sound or plug it into a recording deck if you wish. Even unplugged, this guitar still delivers a full acoustic tone that makes it sound like a much bigger instrument. The Yamaha APX500III is a highly recommended instrument for beginners because it’s comfortable to play. The onboard System 66 pickup/preamp system with a built-in tuner is also easy to use. What’s more, not only does it have a cutaway to make the upper frets easier to reach, it also has a thinline body style. A thinline body means it’s not as thick or as deep as a regular dreadnought. By giving the APX500III a thin body, Yamaha was able to offer a guitar that is easier to hold, especially for players with a small stature such as older kids, teens and petite or small-bodied adults. You can more easily put your arm around the guitar when you play, decreasing the pressure on your shoulder and your arm. The sound coming from the thinner body isn’t as loud as that of a full-size dreadnought but it is still pretty impressive for its size. It situations when more volume is needed, simply plug it into an amp. You can tweak the output via the preamp, which has controls for volume and tone. Other specs include a spruce top, nato back and sides as well as a nato neck with a rosewood fretboard. Taylor had the idea to make a guitar that would suit kids and be small enough to be travel-friendly, and the Baby Taylor was born. 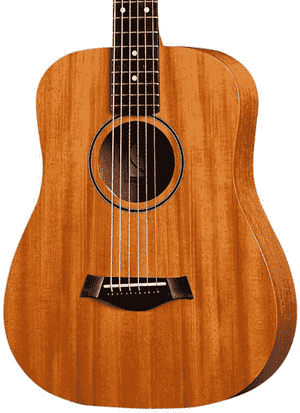 The Baby Taylor BT2 is a 3/4 size dreadnought with a solid mahogany top, which is why it’s also called the Baby Mahogany. The mahogany top delivers a dark, bassy tone with a pronounced midrange, and it will sound richer and fuller the more the guitar is played. The sides and arched back are made of layered sapele, which makes the guitar not only attractive but durable as well. The layered wood construction also makes the BT2 more affordable, a plus for beginners who want to get started on a quality acoustic guitar. Because of its smaller body and decreased weight, the Baby Taylor is not only an ideal instrument for kids and traveling musicians, it’s also great for adult guitar players with a limited reach. And even though it has a small body, it packs a lot of volume for a mini dreadnought. The Baby Mahogany BT2 doesn’t come with electronics but for musicians who simply have no need for a pickup, that’s absolutely fine. There are aftermarket options anyway, right? The Yamaha APXT2 is the 3/4 size version of the APX500III, which means it’s an even better option for guitar players with small hands. This little acoustic-electric guitar sports the same thinline body with a cutaway. The electronic system is a bit different, though. The Yamaha APXT2 is equipped with a System 68 contact pickup and active preamp with volume and tone controls. It’s an ART-based pickup system (ART stands for Acoustic Resonance Transducer). The ART system is designed around the guitar’s internal bracing and allows for optimal pickup placement. This maintains the guitar’s acoustic tone when it’s plugged in, resulting in a natural, expressive and dynamic acoustic-electric sound. The APXT2 also has Yamaha’s proprietary tuner, which deserves a medal for being extremely accurate and easy to use. The Yamaha APXT2 has a laminated spruce top, a nato neck, meranti back and sides, a 21-fret rosewood fretboard with dot inlays, vintage-style covered tuners and a rosewood bridge. Sound-wise, the projection isn’t as great as that of guitars with a bigger body of course, but it’s enough for practicing and camping trips. For more volume, just take advantage of the pickup/preamp system – it’s pretty basic but it works! Good to have and hold, he Martin LXME Little Martin is an excellent companion for traveling musicians and small-bodied guitarists who find it uncomfortable to play full-sized guitars. Like the other models in the Little Martin series, the LXME features an HPL or high-pressure laminate body construction. The top is a spruce-mattern HPL and the sides and back are made of mahogany-pattern HPL. The neck is made of rust birch laminate while the fretboard is made of FSC-certified Richlite, a composite cellulose/resin material. The use of alternate materials may put off musicians looking for solid, “real” woods in their guitar, but for those who are fine with sustainably sourced materials, the Martin LXME gets a thumbs up. Besides, using laminates and composites brings the cost of the guitar down and makes it more durable and resilient to changes in humidity and temperature. In addition, the sound is as nice as warm as you’d expect from a Martin. Onboard the LXME is a Fishman Sonitone pickup/preamp system. You get a the Fishman Isys T pickup and preamp with volume control, contour and phase switches. It also has a built-in tuner for quick and easy tuning checks and adjustments. But wait – there’s more! Here’s a bonus section where we pick out the best electric guitar models for small hands. Going from acoustic to electric (and vice versa) is a common thing that guitar players do, so we thought it would also be great to list some of the most recommended electric guitars for petite players. Get those amps ready! 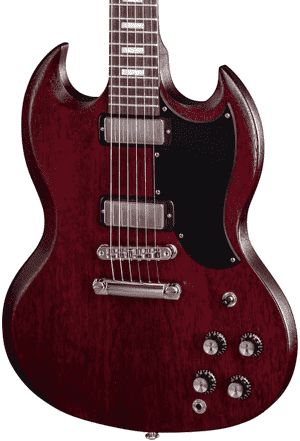 Gibson SG Special Electric Guitar First introduced in 1961 and updated for 2018, the Gibson SG Special features the new Slim Taper asymmetrical neck profile, cryogenically treated frets and a pair of mini humbucking pickups. The smooth-playing neck and a narrow nut width make the Gibson SG Special 2018 comfortable and easy to play for those with small hands. Ibanez GRGM21 Mikro Electric Guitar The Ibanez GRGM21 Mikro looks like a toy, but it’s a real, functional electric guitar. It’s designed for kids to learn on, but that doesn’t mean small-statured folks can’t enjoy playing with it too. The GRGM21 Mikro by Ibanez features a poplar body, a maple neck, a rosewood fingerboard with sharktooth inlays and a pair of Infinity R humbucking pickups. Squier Vintage Modified Jaguar Electric Guitar The Squier Vintage Modified Jaguar is a faithful reproduction of the legendary Fender Jaguar electric guitar, but at a more affordable price and with updated features for a modern playing feel. This Squier model has a slightly shorter scale length than a typical electric guitar, making it easy to play for those with small hands. Comes with Seymour Duncan pickups. Fender Modern Player Telecaster Thinline Deluxe Electric Guitar If you’ve ways loved the Fender Tele Thinline style, there’s more to love in the Fender Modern Player Telecaster Thinline Deluxe. This model is a truly modern take on the much-admired Telecaster. It actually sports the same core features, with a twist: Look closely and you’ll notice an f-hole at the top, making this Modern Player somewhat of a hybrid. The SG Special has been in the Gibson catalog since 1961. In 2018, Gibson updated the SG Special with cryogenically treated frets and a new Slim Taper neck. The cryogenically treated frets have a far more superior molecular structure than untreated frets, making them more stronger, more resistant to abrasions and more durable without being harder. The asymmetrical Slim Taper neck profile is considered as one of the most ergonomic and naturally comfortable neck shapes by musicians all over the world. When you hold the SG Special, you will notice that the mahogany neck has a deeper, slightly more rounded arch where the inside base of your thumb curves into your palm’s lower edge, while there’s a flatter or more subtle arch where the upper part of your palm begins to curve toward the base of your index finger. Basically, Gibson shaped the neck of the SG Special according to the shape of your hand. The new neck profile contributes to the guitar’s playability and increases player comfort so you can play fast without getting fatigued even if you’ve been playing nonstop. Top specs include a mahogany body, rosewood fretboard and mini humbucking pickups at the neck and bridge. 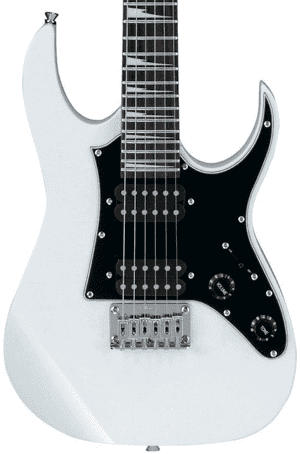 Make way for the Ibanez GRGM21 Mikro, designed for pint-sized players of all ages. Even if you’re not small in stature, this guitar also makes for a worthy companion on the road or when you’re simply busking on your favorite street corner. It’s easy to carry around, being 3/4 the size of a full-size guitar. The Ibanez GRGM21 Mikro has a 22.2-inch scale length, making it easy for players with small hands and a limited reach to fret chords across the neck. The Mikro has a poplar body, a maple neck and a rosewood fingerboard with medium frets and sharktooth inlays. It’s equipped with Infinity R humbuckers at the neck and bridge. There are controls for volume and tone as well as a 5-way pickup selector. The Squier Vintage Modified Jaguar possesses the classic Jaguar scale length: 24 inches, which is shorter than the full scale length of 25.5 found in most Fender electric guitars. Because of the shorter scale, you won’t have to exert a lot of effort reaching for the lower frets. If you’ve got small hands, this is a really big deal! 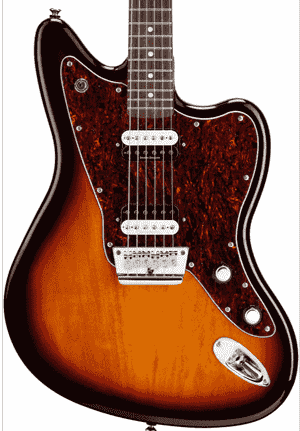 The Squier Vintage Modified Jaguar has a basswood body and a C-shaped maple neck topped with a rosewood fingerboard. It has the classic features of the Jaguar (such as the headstock and chrome tuning machines) but it also comes with updates to give players a more modern playing feel and an improved sound. New for this model are the two Jaguar single-coil pickups designed by Seymour Duncan. These pickups guarantee that the tone coming out of the Vintage Modified Jaguar not only captures the vintage vibe but is also versatile and can be applied to different musical styles. Each of the single-coil pickups also has its own On/Off switch. This guitar also has voiced rhythm and lead circuit controls as well as a tone circuit switch. The overall tone is open-sounding and bright – exactly how a Jaguar should sound. Where the Fender Modern Player Telecaster Thinline Deluxe exceeds in name it makes up for in weight. This is guitar is lighter than most guitars with the same size, thanks to the hollowed-out body characteristic of the Telecaster Thinline. There is a single f-hole right on the top. This Modern Player has a mahogany body that’s been given a gloss polyester finish. The C-shaped maple neck also has the same finish and it’s topped with a maple fingerboard with 22 medium jumbo frets. The scale length is standard for a Tele, 25.5 inches, so while this guitar is of a good light weight because of its semi-hollow body, it may require just a bit of extra reach or the use of a capo. The Telecaster Thinline Deluxe comes with a pair of single-coil Modern Player MP-90 pickups that are connected to a set of four skirted amp control knobs – two for tone and two for volume. There’s also a three-way pickup selector switch. This guitar also features a vintage-style Stratocaster bridge. The Fender Modern Player Telecaster Thinline Deluxe has a unique voice – not quite the same as a Tele’s because of the hollow body construction, but noteworthy nonetheless. Your choice of an acoustic or an electric guitar hinges on several things. Factors such as your personal preferences as to color and guitar body shape, the style of music that you like to play, your needs in terms of performance and portability, your budget and of course, your level of comfort all come into play when you’re picking out the best guitar for you. For this guide to the best acoustic guitar for small hands, we’re focusing on the factor that can make or break your playing experience: your reach. Having small hands, short arms or a smaller body build can make it difficult for many people to play the guitar. Children, teens, petite women, short-bodied men and other people with a limited reach can find it hard to hold a full-size guitar and fret chords, especially if there’s a big guitar body and a full scale involved. Note that we aren’t saying small-statured individuals can’t play guitar – we’re saying they can certainly play, only not as comfortably as other people. Players with small hands would have to make the adjustment. They would need to flex their shoulder more, extend their arms more and stretch their hands and fingers beyond their normal capacity a whole lot more. This overexertion can result in joint and body pain, which puts a rather dark note on the playing experience. Thank heavens that guitar manufacturers have recognized that guitar players come in all shapes and sizes – you know, because they’re people – and have come up with guitar models that offer a more comfortable way to play without sounding like a toy. One of the biggest problems that people with small hands have when playing guitar is the discomfort they feel with trying to fret strings properly. This is where a slim, ergonomic neck profile comes to the rescue. A guitar neck with a slim profile (such as that of the Gibson SG Special and allows you to make chord shapes without having to exert too much effort holding the neck and fretting chords. A narrower width at the nut also contributes to playing comfort by lessening the amount of fretboard real estate to traverse. It puts strings closer together, so if you have small hands you’ll have an easier time fretting notes on different strings. Guitars with a full depth can give smaller people a bit of a challenge holding them. Small players can feel like they’ve got a double bass sitting across their lap instead of a dreadnought guitar. A guitar with a thin, compact and/or light body is the solution to this dilemma. The acoustic guitars, as well as the electric guitar models we’ve picked for this list exhibit one or more of these characteristics. The Yamaha acoustics are both thinline models and have a shallower body depth. Both also have a cutaway, making it easier for short fingers to form chords at the upper frets. The APXT2 is also smaller with its 3/4 size. 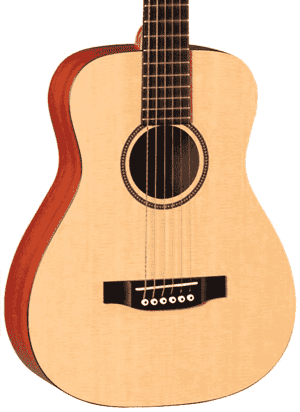 The Baby Taylor BT2 and the Martin LXME are also small-bodied guitars perfect for small hands. On the electric side, the Ibanez Mikro sports a small body, while the Fender Modern Player Telecaster Thinline Deluxe has a decreased weight. A shorter scale length means the frets are closer together. Guitars with a short scale length are easier to play for people with small hands especially if they need to fret notes on different frets. The Yamaha APXT2, Baby Taylor BT2 and Martin LXME Little Martin are some of the best acoustic guitars for small hands because of their shorter scales. For those into electric guitars, the Ibanez GRGM21 Mikro and the Squier Vintage Modified Jaguar both feature a shorter scale length and fit the bill as the best electric guitar for small hands. Yes, this is true, but it takes a lot more effort. Instead of being able to enjoy playing guitar, people with small hands would have to more carefully make sure they’re reaching the right fret and holding down the right strings. It’s all possible, but that doesn’t mean it’s easy or comfortable. It would be highly unfair to have to be the one to adjust just because you’re small and the guitar is big. If a full-size guitar suits your small hands just fine, then that’s awesome. But why don’t you try playing a smaller, thinner or lighter guitar? We’re certain you’ll find it more comfortable and enjoyable to play, and you won’t feel as tired after hours of playing. Check out the guitars we’ve listed here and take your pick!